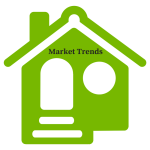 Sandy Springs real estate market trends show it may be the perfect time to sell. The median sold price for single-family homes in 2018 continues to increase. Homes sold in March 2018 had a 18% increase over the median sold price in December 2017.